fastjet is turning its attention to Zambia as the fledging pan-African low-cost carrier group seeks to add at least one affiliate in 2014. The Zambian market is relatively small but has potential and is much less competitive with fewer obstacles than the other African markets fastjet has been looking to enter. The fastjet group has been preparing to enter the South African domestic market and also has been planning joint ventures in Kenya and Nigeria. But fastjet Zambia could end up becoming the second fastjet-branded carrier, with a potential mid-2014 launch. Lusaka in Zambia is already in line to be the second international route after Johannesburg for fastjet Tanzania, which is the group’s only existing fastjet-branded operation. fastjet Zambia would also serve South Africa, once again providing new competition for South African Airways in one of its most lucrative markets and potentially diminishing the need for a South African affiliate. In a 17-Jan-2014 announcement, London-listed fastjet confirmed that it is in discussions with the Zambian government to establish a new fastjet affiliate. The new Zambia-based carrier has begun the process of applying for an air operator's certificate (AOC) and is expected to be majority Zambian-owned with a “substantial” but not yet specified stake from fastjet. The group says the process of securing an AOC from Zambian authorities “is likely to take up to six months”. fastjet Zambia plans to serve the domestic and regional international markets, both of which are under-served and could see rapid growth through low fare stimulation. Zambia has a population of about 15 million and has been one of Africa’s more politically and economically stable countries. Launching in Zambia is far from certain given the typical bureaucracy in Africa and fastjet’s so far less than stellar track record of launching new affiliates. Since fastjet Tanzania launched in late 2012 with a fleet of three A319s, the group has signed MOUs to establish joint ventures or affiliates in South Africa, Kenya and Nigeria. fastjet has also looked at extending the fastjet brand and A319 operation to Angola and Ghana, where the group owns stakes in carriers operating under the Fly540 banner, which it aims to restructure. Fly540 provides fastjet with AOCs for possible A319 operations as the group does not sees the long-term potential of the current Fly540 turboprop and regional jet operation. In addition to Angola and Ghana, Fly540 has an operation in Kenya. But fastjet has two potential options for the Kenyan market as it also has an MOU to establish a joint venture with grounded carrier JetLink Express. In Nigeria fastjet has an MOU with proposed start-up Red 1 Airways while in South Africa it has been working over the past nine months to establish a new airline with local partners after its attempt to buy grounded South African LCC 1time failed. Of all the potential markets for the fastjet brand, Zambia is by far the smallest. Zambia’s international market currently consists of only about 38,000 weekly seats, making it the 18th largest in Africa. South Africa is the third largest international market in Africa, after Egypt and Morocco, and the largest in the fastjet target region of sub-Sahara Africa. Kenya is the sixth largest in Africa and the third largest in sub-Sahara Africa after Ethiopia and South Africa. Ghana and Nigeria are also among the top 10 international markets in Africa and the top five in sub-Sahara Africa. Angola is the 16th largest market in Africa and the 11th largest in sub-Sahara Africa, just behind fastjet’s original home market of Tanzania. South Africa, Kenya, Ghana, Nigeria and Angola also have larger populations and GDPs compared to Zambia. South Africa also has by far the largest domestic market in Africa. Nigeria has Africa’s second largest domestic market while Kenya, Ghana, Angola and Tanzania are all among the top 10 albeit relatively small. Zambia’s domestic market is not even among the top 20. But the obstacles that fastjet will need to overcome compared to its other potential markets are much smaller. Zambia represents a relatively low risk venture with moderate to high potential. The struggles that fastjet has faced in trying to expand throughout Africa since launching in Tanzania in Nov-2012 highlight the huge obstacles impeding LCC growth and airline industry growth overall in Africa. fastjet executives have repeatedly acknowledged they under-estimated the level of protectionism in the market and the extent African governments will take to thwart new competition. fastjet got a similar warm reception from Tanzania. But it has discovered that it needs to go through an inordinate number of loops to set up in most African countries – this applies not only to licensing a new airline but also to simply securing authority to fly from an established base. For the first 11 months fastjet could only operate in Tanzania’s very limited domestic market until it finally secured South African permission to launch long-planned services to Johannesburg in Oct-2013. See related report: Zambia's booming economy increasingly reliant on Kenya and Ethiopian Airways. A flag carrier needed? The proposed new government-backed airline failed to launch in 2013 as originally planned. Zambia has continued in recent weeks to talk up the prospects of a new flag carrier, with Bloomberg quoting the country’s transport minister in early Jan-2014 as saying the government has received interest in the project from investors in Europe, the US, Africa and the Middle East. But the fastjet project should be sufficient to meet Zambia’s need for more air services. By stimulating new demand, fastjet Zambia should be able to significantly grow the domestic and regional international market. Re-establishing a direct link to London will not be a possibility under fastjet but the Zambian government should recognise that establishing a new full service flag carrier is a loss making proposition and that the London route would require heavy subsidies. Supporting and potentially investing in an LCC represents a much better path for smaller and medium-size African countries. As it builds an international network, fastjet Zambia can potentially work with other carriers in selling a one-stop service between Lusaka and London. While fastjet is an LCC it has recognised that only a hybrid model will work in Africa. It uses travel agents and is open to interlining or codesharing with other carriers. It has been discussing, since the end of 2012, a potential partnership with Emirates, which is the largest long-haul carrier in Africa. Emirates is also the second largest carrier in Zambia after South African Airways (SAA). The carrier currently operates two daily A340-300 flights from Dubai to Lusaka with continuing service to Harare in Zimbabwe. 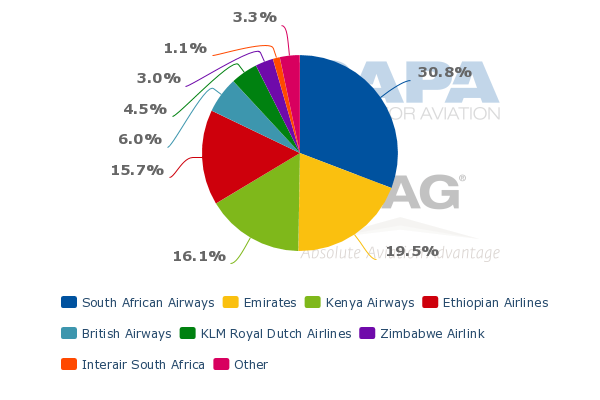 Emirates and SAA both currently provide about 7,500 weekly seats to Lusaka, giving each of them a 24% share of total capacity at the Zambian capital, according to CAPA and OAG data. But SAA has a larger operation in Zambia overall because in addition to Lusaka it serves Livingstone and Ndola. All three cities are served from Johannesburg while Lusaka is also served from Durban and Livingstone from Kruger. 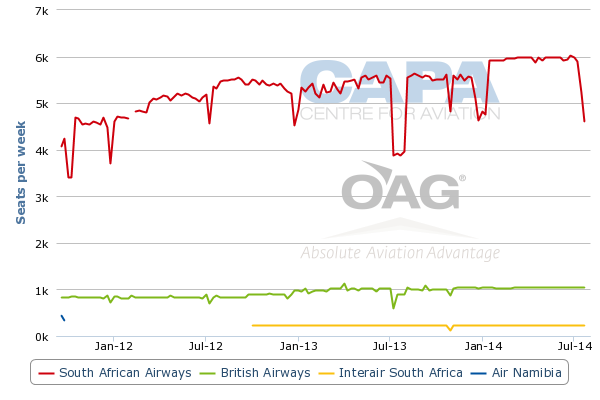 SAA currently has a leading 31% of international seat capacity in Zambia followed by almost 20% for Emirates. Ethiopian and Kenya Airways also have relatively large operations in Zambia, each accounting for 16% shares of international capacity. In addition to serving their east African hubs, Ethiopian and Kenya Airways route some of their Lusaka flights to Harare in Zimbabwe and Lilongwe in Malawi. Both carriers also serve Ndola with continuing service to Lubumbashi in the neighbouring Democratic Republic of the Congo. Ethiopian also operates some flights from Lusaka to Blantyre in Malawi while Kenya Airways also serves Livingstone from Nairobi. There are seven other foreign carriers currently operating scheduled passenger services to Zambia but only accounting for less than 20% of the market. This includes Comair (operating as a British Airways franchise from Johannesburg to Livingstone), KLM (from Amsterdam to Lusaka), Zimbabwe Airlink (from Harare to Lusaka with continuing service to Dar es Salaam), Interair South Africa (from Johannesburg to Ndola), Air Botswana (from Gaborone to Lusaka), Air Namibia (from Windhoek to Lusaka with continuing service to Harare) and TAAG (a weekly service on a Luanda-Harare-Lusaka-Luanda routing. fastjet Zambia should be able to significantly stimulate demand in Zambia’s international market as all the existing routes are plagued with very high average fares. Proflight Zambia currently serves 10 domestic and two international destinations. Scheduled flights are operated with a turboprop fleet consisting of 29-seat BAe Jetstream 41s, 18-seat BAe Jetstream 31s and 12-seat Cessna Caravans. Proflight Zambia is confident it can continue to operate on the Lusaka-Dar es Salaam route, which fastjet Tanzania is launching on 1-Feb-2014 with two weekly A319 flights. Proflight Zambia launched three weekly flights to Dar es Salaam in Nov-2013 using Jetstream 41s. Proflight Zambia filled the void left by Tanzania’s Precision Air Services, which stopped serving Lusaka in mid-2013. Precision and Proflight Zambia now interline, providing Proflight Zambia with connections to other destinations in Tanzania. fastjet is confident it can stimulate new demand by offering fares low enough to attract passengers who now make the arduous 24-hour journey between Dar es Salaam and Lusaka by bus. fastjet return fares start at USD132 including taxes. Proflight Zambia only has one international route, Lilongwe, which it launched in Jun-2013 and currently serves with four weekly frequencies using Jetstream 41s. The carrier says it has been considering further international expansion, including Harare, Johannesburg and Tete in Mozambique. While the establishment of fastjet Zimbabwe could limit Proflight Zambia’s expansion opportunities, particularly in markets like Johannesburg where there is already jet competition, there should still be opportunities for niche international routes. Smaller destinations such as Tete are unlikely to support fastjet service. Proflight Zambia also operated seasonal flights in Dec-2013 and early Jan-2014 to Zanzibar, a smaller niche market in Tanzania that fastjet is unlikely to serve from Lusaka. fastjet Zambia plans to compete against Proflight Zambia and smaller non-scheduled operators in the main domestic markets of Lusaka to Livingstone and Ndola. But Proflight Zambia should be able to maintain a higher frequency service on these routes and continue serving several smaller destinations which cannot accommodate jets or are too thin for fastjet’s A319s. In Tanzania, fastjet serves only four domestic routes with a combined 38 weekly return frequencies. Smaller markets continue to be served by full service regional carriers. Tanzania and Zambia are not ideal markets for fastjet as neither can provide the scale LCCs typically require to succeed. 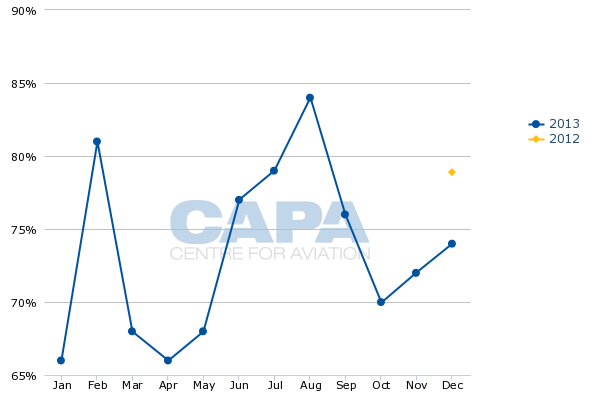 In Tanzania fastjet has not grown its fleet since the end of 2012. Following the launch of service to Lusaka, utilisation of its three A319s will start to approach more normal levels but at about eight hours will still be unusually low for LCCs. In its first year of operations fastjet had success at stimulating demand despite having to rely almost entirely on the Tanzanian domestic market. The carrier transported 365,000 passengers in 2013 with monthly load factors ranging from 66% to 84%. fastjet carried a record 37,458 passengers in Dec-2013 and reported record average yield per passenger at USD97. Revenues in Dec-2013 were USD3.6 million, representing the first time monthly revenues exceeded USD3 million. fastjet Tanzania should be able to continue growing revenues and improving aircraft utilisation levels as it continues to build out its international network. fastjet told CAPA in Oct-2013 that along with Lusaka, the carrier aims to launch five other international destinations in 2014: Lilongwe, Entebbe, Juba, Nairobi and Mombasa. But most of these routes are unlikely to be served daily. With domestic expansion also limited (most Tanzanian airports cannot accommodate jets) it is unlikely the Tanzania-based fleet will grow significantly beyond four or five aircraft. It is also hard to imagine more than four or five aircraft in the medium term for the proposed new Zambia base. But the second base presents an opportunity to fill out the network and start connecting the dots. With low fare stimulation Zambia could support three or four domestic routes with similar frequencies as Tanzania, where the four domestic routes are served between three times per week and double daily. But more importantly international services can be supported to most of the same seven destinations that are served, or are expected to be served, from the Dar es Salaam base by the end of 2014, as well as potentially a couple of new destinations. As was the case with Dar es Salaam, Johannesburg represents the most potential. Lusaka is an even bigger market from Johannesburg than Dar es Salaam. And once it secures its Zambian AOC, fastjet will again be able to break a SAA monopoly on one of the South African flag carrier’s most lucrative routes. SAA currently operates five daily flights between Johannesburg and Lusaka using a mix of 737-800s, A319s and ERJ regional jets, according to OAG data. On Johannesburg-Dar es Salaam, SAA only operates 13 weekly flights. fastjet currently operates three weekly flights on Johannesburg-Dar es Salaam but is confident there will be sufficient demand to upgrade the route to daily by the end of 2014. Johannesburg-Lusaka should be able to support at least two daily LCC frequencies in the short to medium term. fastjet has expressed interest in becoming the first Zambian carrier on several regional international routes and says it is “confident that its market-stimulating pricing model will grow traffic on these routes substantially”. In its 17-Jan-2014 release fastjet particularly singled out Lusaka-Johannesburg as “the key route”. While SAA has some competition on Johannesburg-Livingstone (also operated by Comair with the BA code) and on Johannesburg-Ndola (also operated by Interair South Africa), it has a monopoly in the larger Johannesburg-Lusaka market. Johannesburg-Livingstone could also be a potential fastjet route. Livingstone was served by 1time from 2009 to 2012, giving Zambia its first taste of an LCC. As Livingstone is the gateway to the Zambian side of Victoria Falls, it is primarily leisure destination with significant stimulation possible as fares are currently high. Johannesburg-Lusaka is more a business market with large potential demand from migrant workers and visiting friends and relatives (VFR) if fares are reduced to more normal levels. SAA currently has an 82% share of capacity between Zambia and South Africa. Zambia is SAA’s largest international market, accounting for 9% of its total international seat capacity. 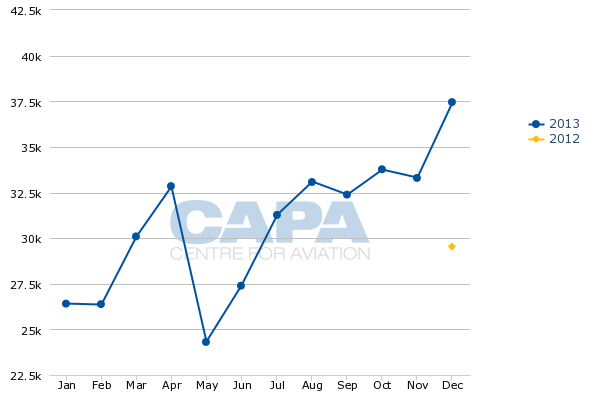 With LCC stimulation the market could expand significantly beyond the current 14,000 weekly return seats. fastjet could end up covering most of South Africa’s main regional international markets using affiliates in other countries. fastjet has repeatedly said that having a presence in the South African domestic market is critical for any pan-African LCC group. But while South Africa represents Africa’s biggest domestic market it is also the most competitive and the most penetrated by LCCs. In fact the South African domestic market now accounts for about 85% of LCC capacity within Africa. Competing against South Africa’s two existing LCCs, SAA subsidiary Mango and Comair subsidiary Kulula, will be challenging and expensive. While there should be sufficient demand on domestic trunk routes to support a new entrant, fastjet may lack the cash to survive a drawn out battle. fastjet could be better off using its relatively limited funds on smaller un-penetrated niche markets. fastjet also seems reluctant to move forward with projects in two other larger African markets, Kenya and Nigeria. The upcoming launch of Kenya Airways budget subsidiary Jambo Jet will make it challenging for fastjet in the Kenyan market while in Nigeria competition is already fierce between several domestic carriers. Angola and Ghana have opportunities but have not been a short to medium term priority. fastjet sees too many business challenges in Angola and too many infrastructure challenges in Ghana. fastjet will need to expand slowly. The group will likely add a couple of aircraft in 2014 – there are plenty of A319s available on the market. But its expectation for a 15-aircraft fleet, which it initially planned to have by the end of 2013, could take a few years to materialise. Focusing on small markets such as Zambia will minimise risk and allow fastjet to fine-tune its model. LCCs are not about to rapidly ascend in Africa like they have in Southeast Asia over the past decade or before that in Europe and North America. Eventually Africa’s larger countries will start to recognise the huge economic benefits that come with competition and low fares. But until then it is wise for fastjet, and other African LCC groups that are waiting in the wings, to be patient and settle for planting flags in smaller markets.